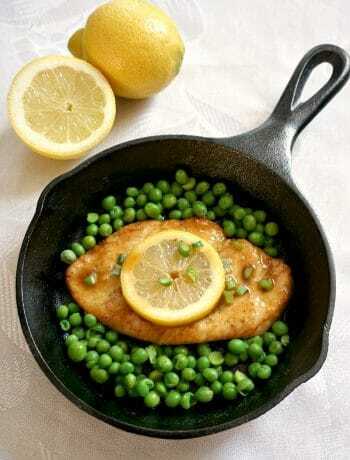 Chicken breasts are my first choice when it comes to a good old chicken dinner recipe. They are not only lean, low in fat and calories, but they also cook quickly, no matter the cooking method or the dish. My Baked Honey Mustard Chicken Breast with a Touch of Lemon is still one of my most popular post on the blog, and I know that chicken can never fail. So, this time I wanted to create something equally delicious, but just a bit different. It’s still baked, but the stuffing really takes dish to the very next level. Ricotta and spinach are a match made in heaven for me, and I often use this combo, my favourite recipes using it being Turkey Spinach Lasagna Recipe with Ricotta, Tomato, Spinach and Asparagus Tartlets with Ricotta, and Spinach Pinwheels with Ricotta. Unlike the cream cheese, ricotta is not as rich, but it’s still creamy, and I have so far used it only in savoury dishes, all of them beign a smashing success. Throw some spring onions into this combination, and you get one delicious stuffing for our chicken breasts. It can’t get simpler than that! 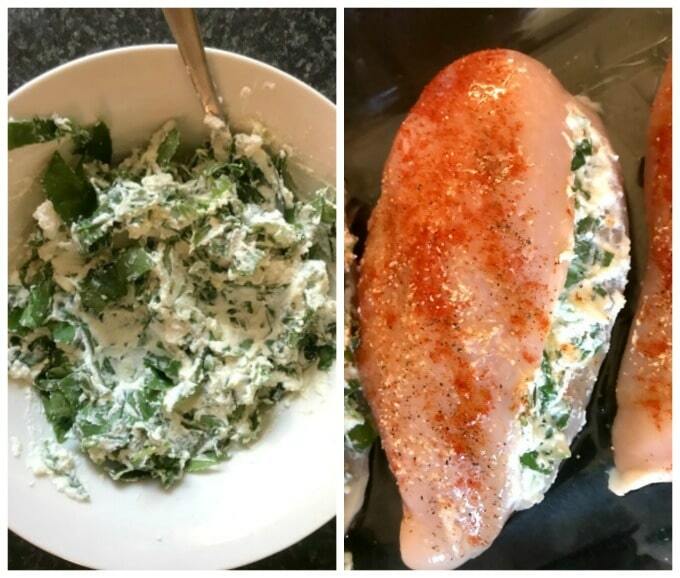 You can use frozen spinach if you don’t have fresh one, it should not change the texture of the chicken breasts, but do make sure you squeeze out all the liquid once the spianch is thawed. 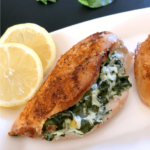 How do you make spinach-stuffed chicken breast? Use a sharp knife to make a pocket into the chicken breasts, or you could cut them up horizontally,without cutting all the way through. 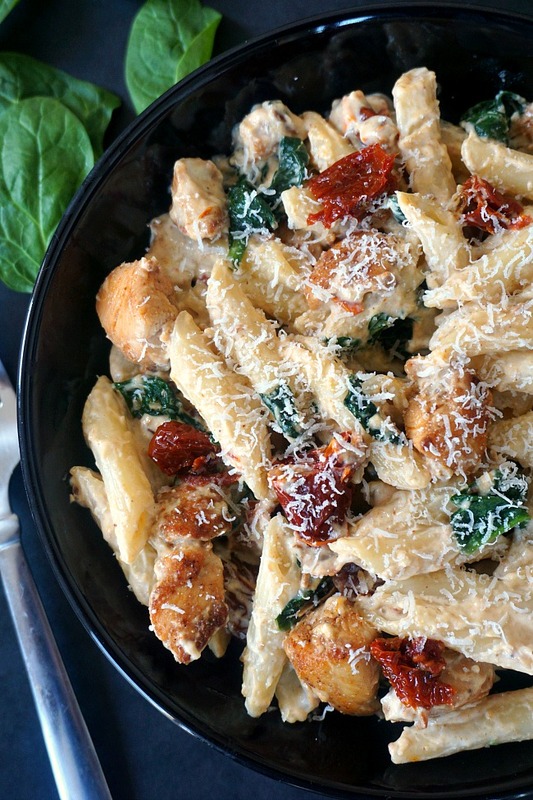 In a bowl, mix together the ricotta, chopped spring onions and thawed spinach, and stuff the chicken breasts with it. Season the chicken with salt, pepper, and rub in some paprika and garlic powder. Drizzle a bit of olive oil to keep the chicken moist. So, depending on your oven, the chicken should not need any longer than about 40 minutes at 200 degrees Celsius (390 Fahrenheit). But, do check it after 30 minutes or so, if needs be, remove the chicken juices from the pan if you think that’s preventing the chicken breasts from browning on the bottom side. 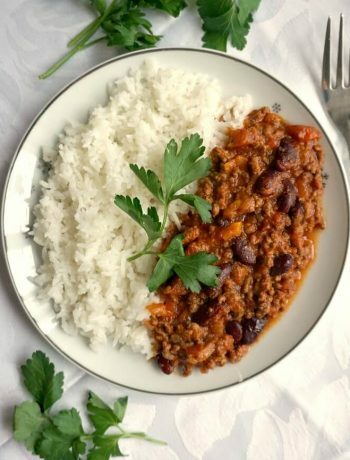 Apart from the lovely lemon kick, you could also use some chilli flakes, or cayenne pepper if you want a bit of spiciness to it, although I thought it was just perfect for my taste the way it got cooked. Also, if ricotta is not really your favourite, you can substitute it with cream cheese. Spinach, although it’s alwways my first choice, can be replaced with kale, but I’m not quite sure how that would taste, I must say I hardly ever cook with kale. Shocking, isn’t it? But there you have, a fabulous homemade recipe to knock your socks off. Will you try this for dinner? 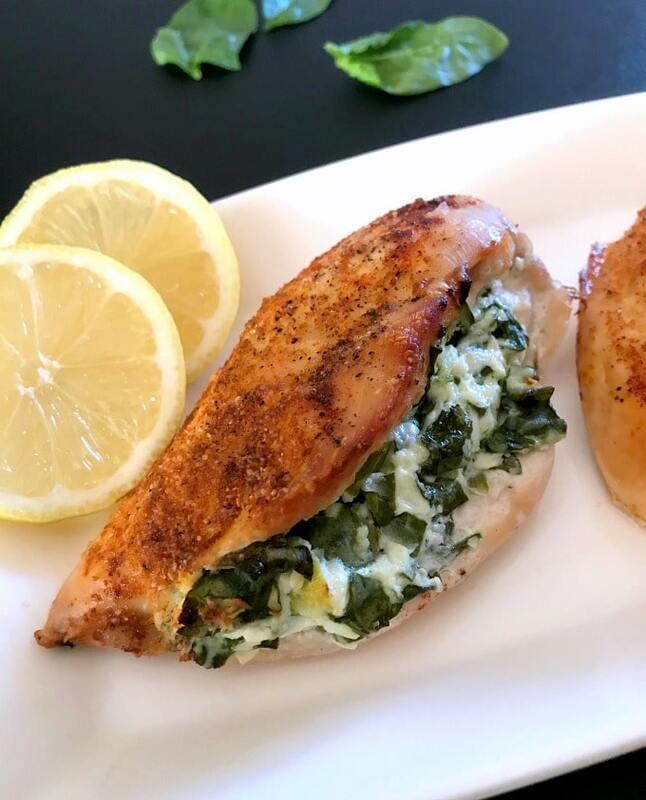 If you’ve tried this BAKED SPINACH-STUFFED CHICKEN BREAST or any other recipe on the blog then don’t forget to rate the recipe and let me know how you got on in the comments below, I love hearing from you! You can also FOLLOW ME on FACEBOOK, and PINTEREST to see more delicious food and what I’m getting up to. 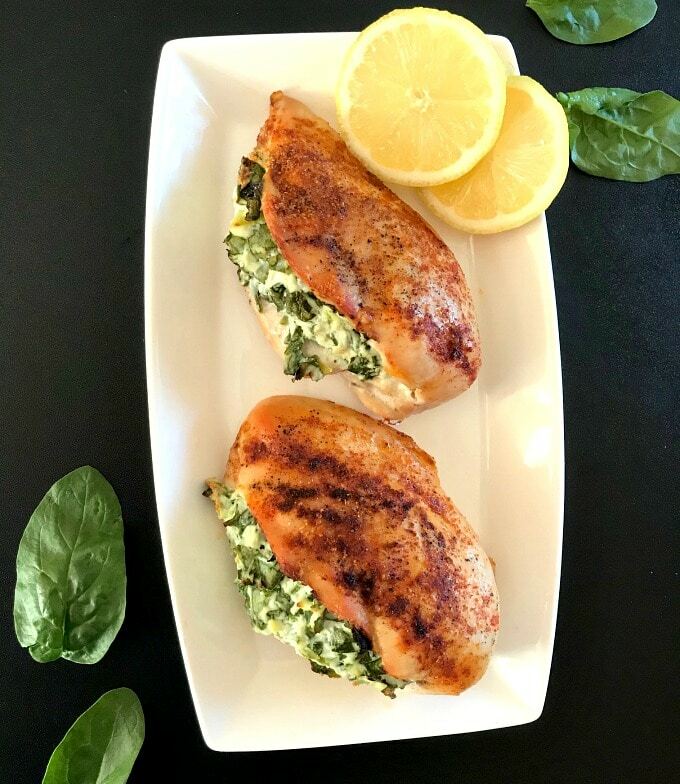 Baked Spinach-Stuffed Chicken Breast with ricotta, a healthy low-carb, gluten free, high-protein recipe that is super delicious, and super easy to make. My favourite chicken dinner recipe. Chop the spinach and spring onions, and add them to a bowl together with the ricotta. Using a sharp knife, make a pocket into each chicken breast, then stuff with the spinach filling. Mix the salt, pepper, paprika and garlic granules, then rub each chicken breast with the mixture. Drizzle a bit of olive oil over the chicken breasts. Bake in the oven for about 40 minutes, or until the chicken is cooked through. Serve hot with a bit of lemon juice drizzled over.